Prepare land for winter grazing by closely grazing or mowing down the existing pasture in the fall, prior to planting. This results in less water, nutrient, and light competition with the emerging cool-season forages. You can also till an area for producing cool-season forages. 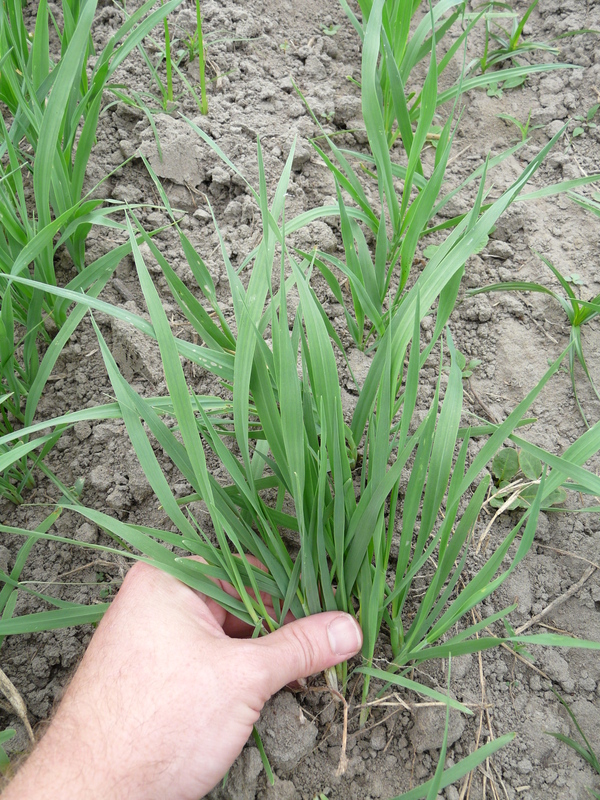 Forages started in tilled soil will grow faster and often outperform over-seeded forages. A prepared seedbed minimizes competition for resources and during cooler periods, the exposed soil will warm more than soil under residues. 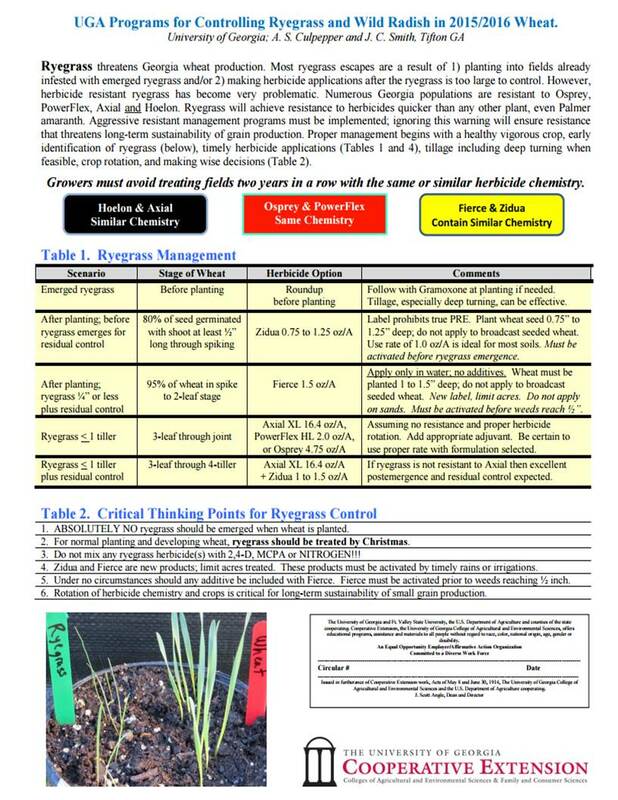 Target soil pH to a range from 5.5 to 6.5. If you find that your soil is near the low (acidic) end of the scale, consider applying lime. However, do not apply lime within a month of your fertilizer application, as you may increase nitrogen volatilization (N loss) and tie-up more soil phosphorous (P), leading to less available fertilizer for the plants. If you have not limed yet, you might consider waiting until winter, or before the spring transition into summer forages. 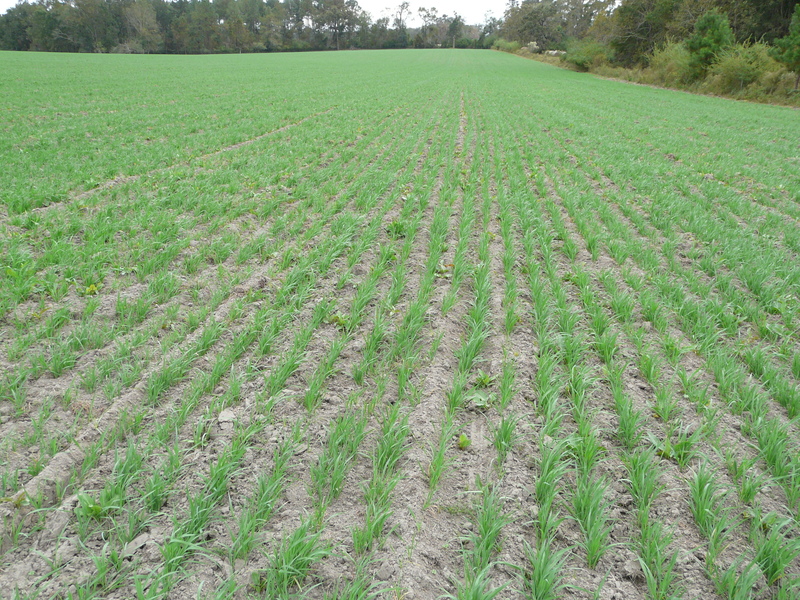 For cool-season grasses in Florida & SW Georgia, 30 lbs N/acre is recommended at or near planting, then another 40 to 50 lbs N/ac after the plants have established (beginning to branch or tiller). If you want greater clover competition, apply less N (30 to 50 lbs near planting and no additional application). Under grazing, you might find that applying another 30 to 50 lbs N/acre in early spring is required, particularly if there are leaching rains, or livestock are not redistributing excrement uniformly across the pasture. If El Nino conditions prevail through the 2016 winter/spring, you may find yourself under flooded conditions. 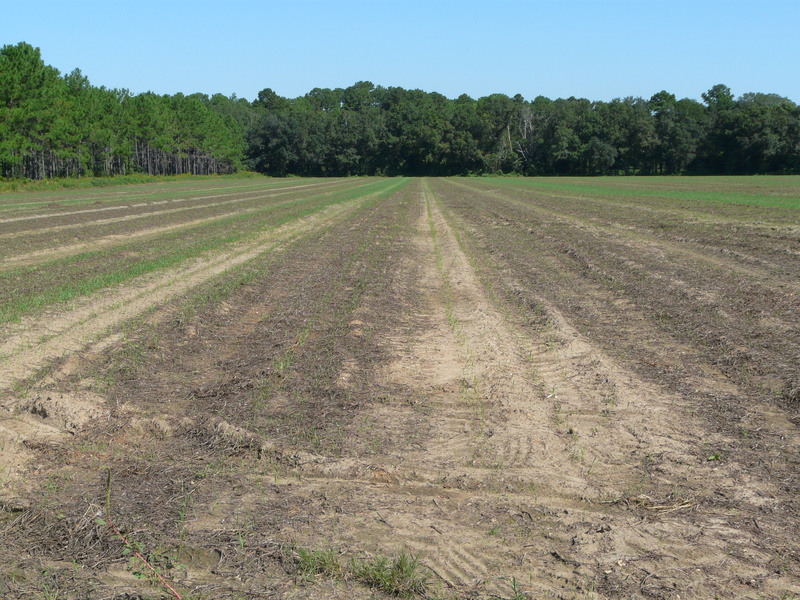 Annual ryegrass and white clover survive saturated soils better than most other Florida cool-season forage options. Saturated soils will also lose N via denitrification (gaseous loss). Do not apply additional N fertilizer until the soils have adequately drained. Planting now through mid-November ensures well-established plants with deep root systems to capture nutrients that may leach during large rain events. Also, managing grazing to retain adequate forage (3 inches or more stubble height or grazing to remove only half of your canopy height) will insure adequate rooting mass and depth, in order to capture soil nutrients deeper in the soil profile and promote stronger, more resilient plants and faster regrowth. Keep in mind that the fertilizer investment made for cool-season forages will be returned in animal gains and a healthier pasture. The root mass from winter forages decomposes in early summer, contributing organic matter and slow-release nutrients to the soil that will help support the summer pasture. 1) Hurst, Harold. 1991. 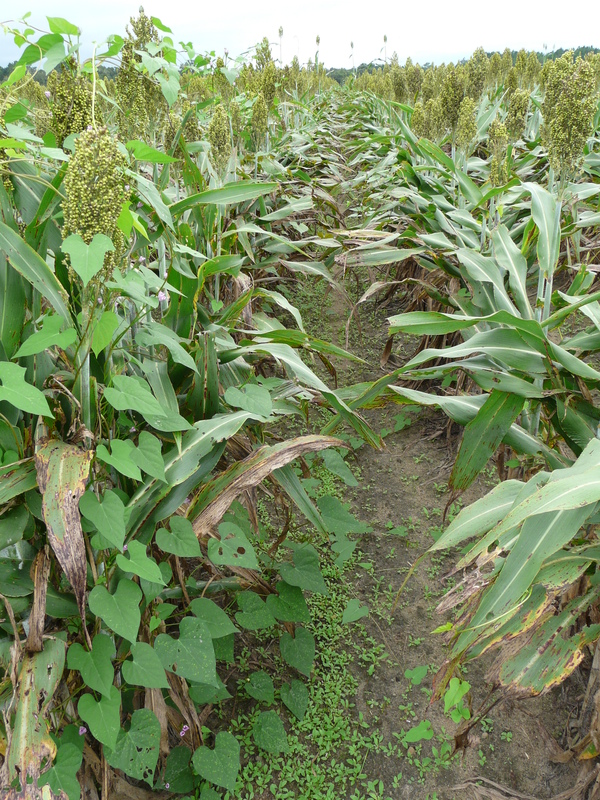 The Use of Dessicants For Field Drying Grain Sorghum With and Without Weeds. Mississippi Agricultural and Forestry Experiment Station Bulletin #974. 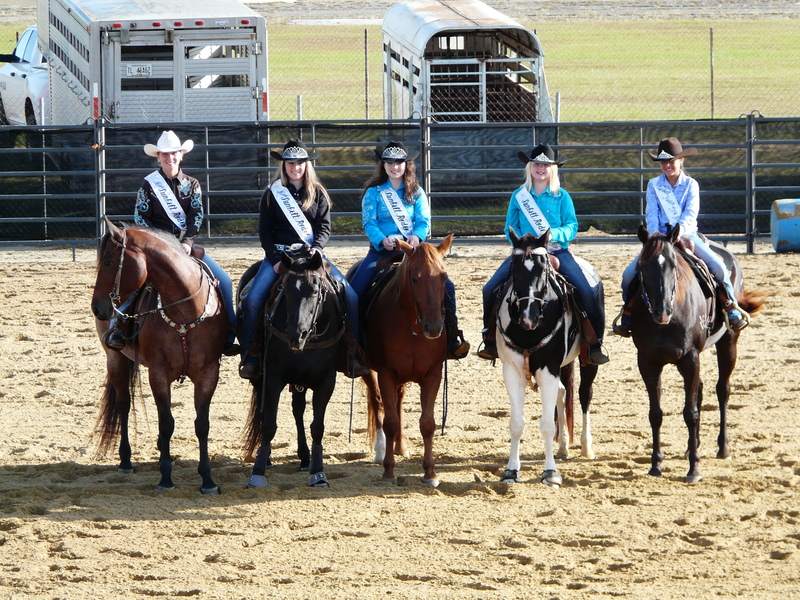 2) Olson, B.L.S, T. Baughman, and J.W. Sij. 2001. Grain Sorghum Dessication with Sodium Chlorate and Paraquat in the Texas Rolling Plains. Texas Journal of Agriculture and Natural Resources 14:80-83. When we treat as a harvest aid, keep in mind that the grain needs to be past the milk stage of development. Dr. Prostko recommends treatment as close to harvest as possible to lessen the chance of morningglory regrowth. 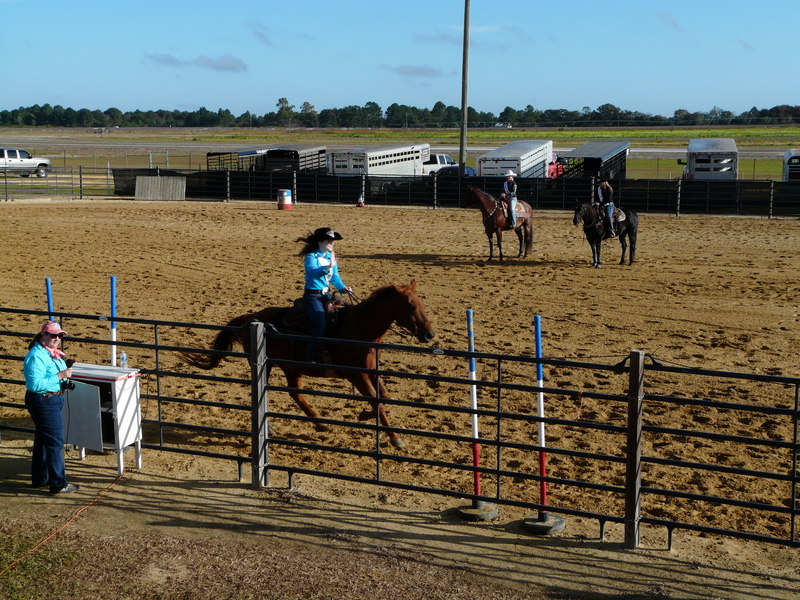 We had a great time at the Expo this year. 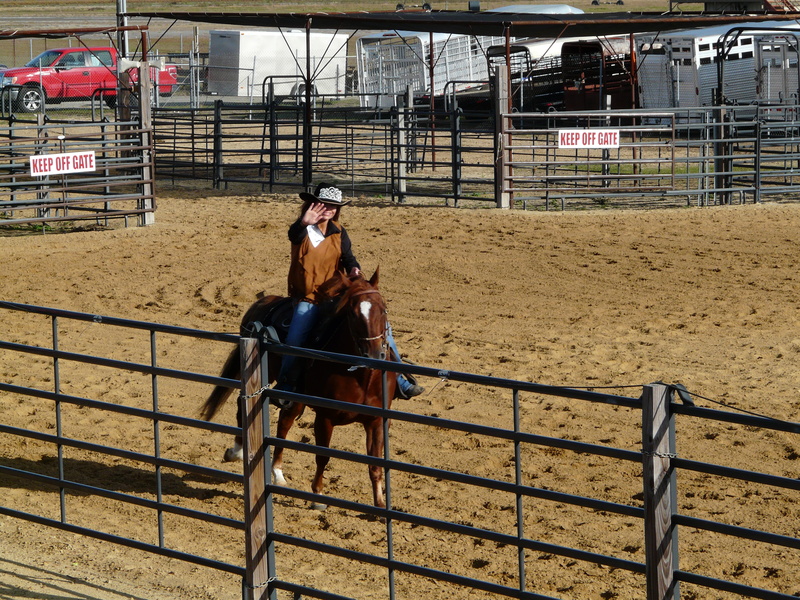 The weather was nearly perfect each day. It was very cool Tuesday morning but got very warm by yesterday. 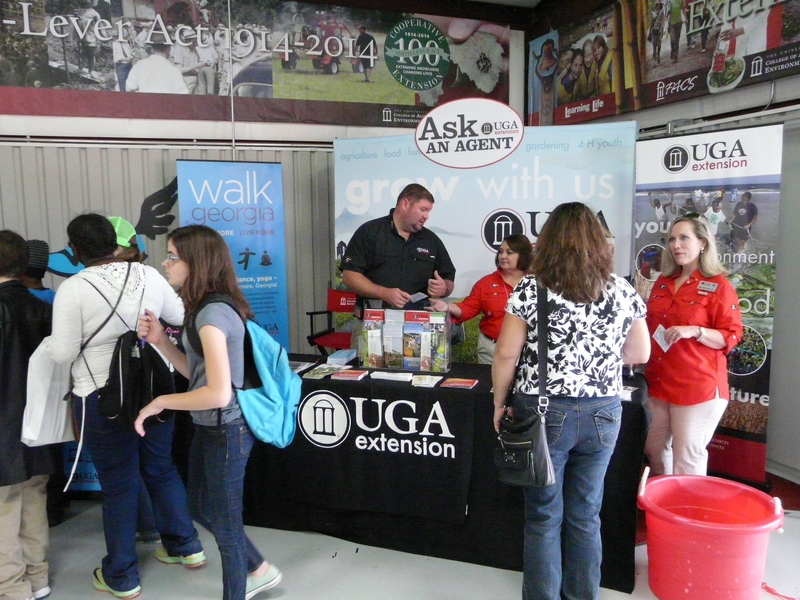 I worked at the UGA building with the College of Agriculture holding down the “Ask an Agent” booth. 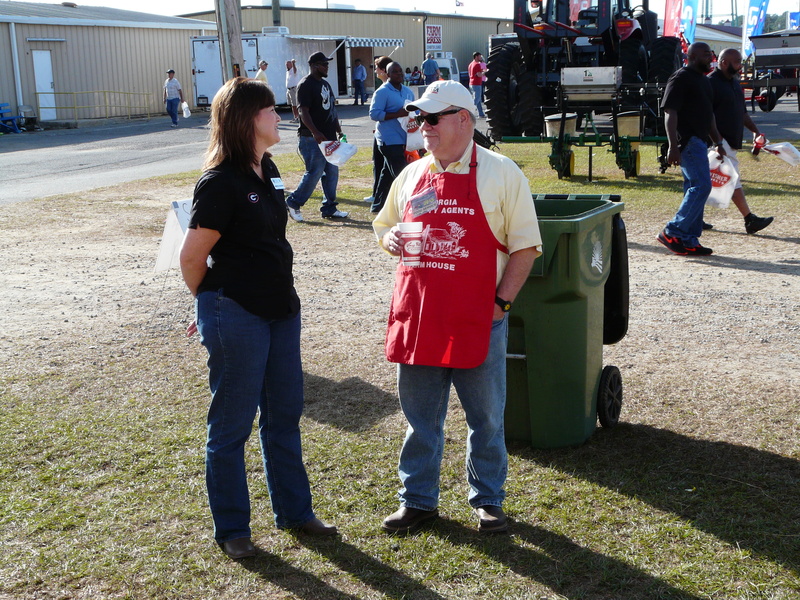 We talked with lots of people from around the state about different types of agriculture, residential, and landowner issues. 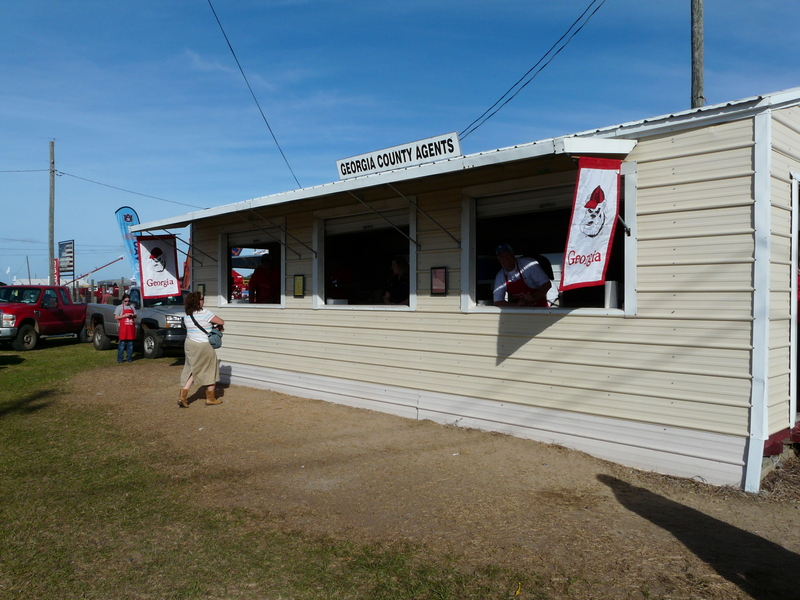 The booth showcases 4-H, FACS, and Ag Agents. 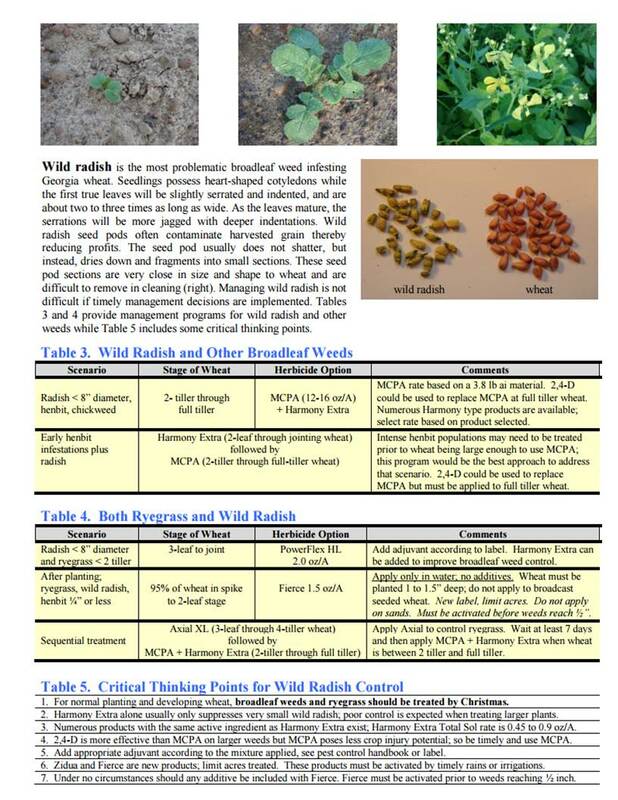 Here is the 2015 Wheat Weed Control program for ryegrass and wild radish from UGA Extension Weed Scientist Dr. Stanley Culpepper. The crop has progressed well and has looked good overall to date. 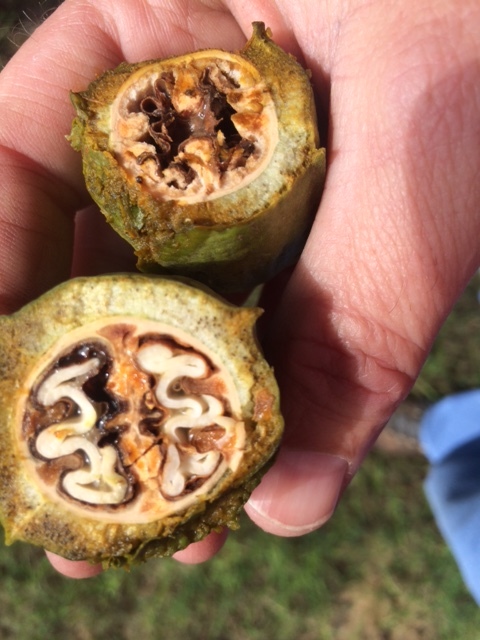 However, UGA Extension Pecan Specialist Dr. Lenny Wells has been contacted on issues with kernels of some varieties. There are a few non-filled kernels or “pops” out there, which is not uncommon. More disturbingly, I had several calls about a problem that is showing up on multiple varieties but is most pronounced on ‘Oconee’. This problem appears as necrotic kernels which have turned to a gelatinous/liquid material inside an otherwise healthy-looking nut. These nuts are different in appearance from the normal “pop” or pollination related kernel abortion. I saw kernels in various stages of this necrosis. It appears to start often on the bottom of the kernel, which begins to turn black and gelatinous, progressing from there. This week, we looked at some Pawnee that are not falling off the tree. The shuck is very shriveled in appearance. Some shucks are split and we wondered about water shuck split. However, this does not usually occur on Pawnee. Dr. Wells believes this issue maybe related to pollination. 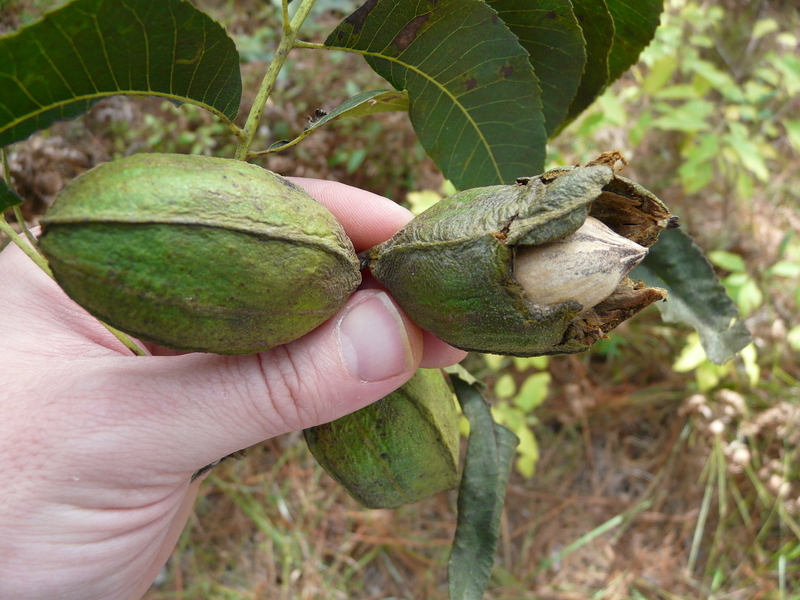 At this point, these nuts will not be able to be harvested. 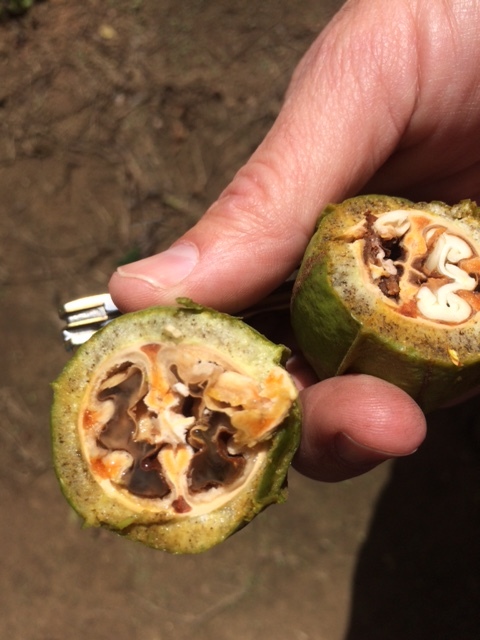 (Dr. Wells) From the calls I received, this appears to be a fairly widespread problem affecting the crop at varying levels. Unfortunately, we don’t really know what is causing this nor to what extent it will affect the crop. Most of these nuts will blow out of the harvester or cleaning plant. I have seen enough out there that I expect growers will notice it more and more as harvest progresses. You’ve seen the news. You’ve seen the devastation that has hit South Carolina in the wake of all the rain they received a few days back. What hasn’t been in the news is how much damage was done to their hay crops. For many farm families, their whole summer’s work has literally been washed away. 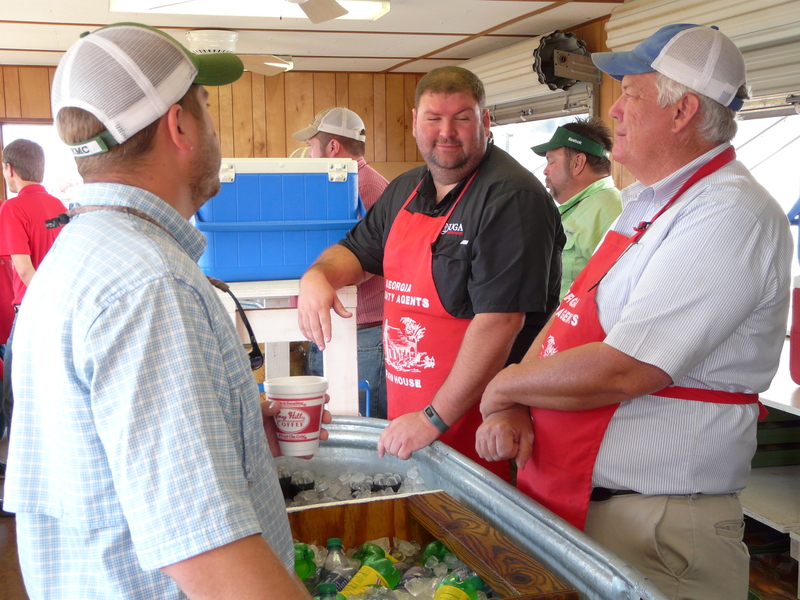 The Clemson Extension Livestock and Forages Team is trying to help with the relief efforts. They are attempting to connect folks from surrounding areas that might have hay available to sell. 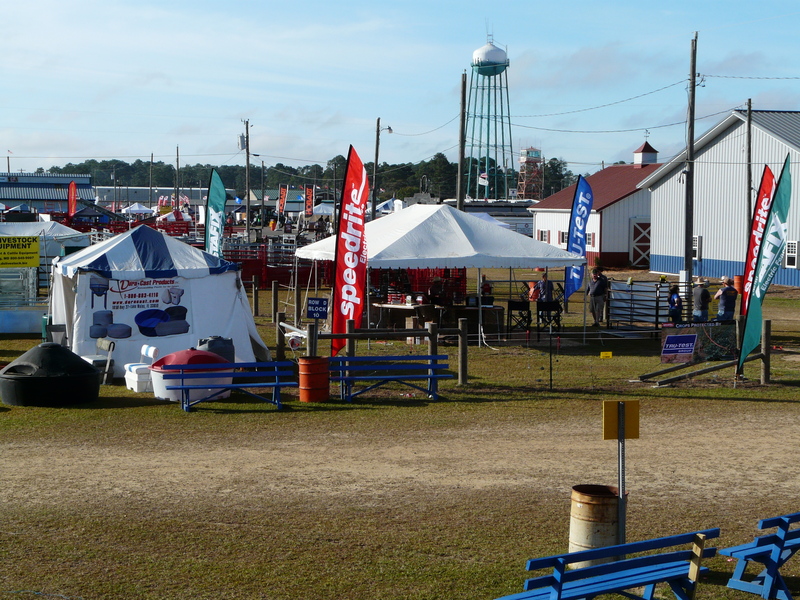 By visiting this web-based form (http://goo.gl/forms/4TyKp34EfG) and providing the pertinent details about the hay you have available, it may help connect you with a farm family in South Carolina that needs your assistance. 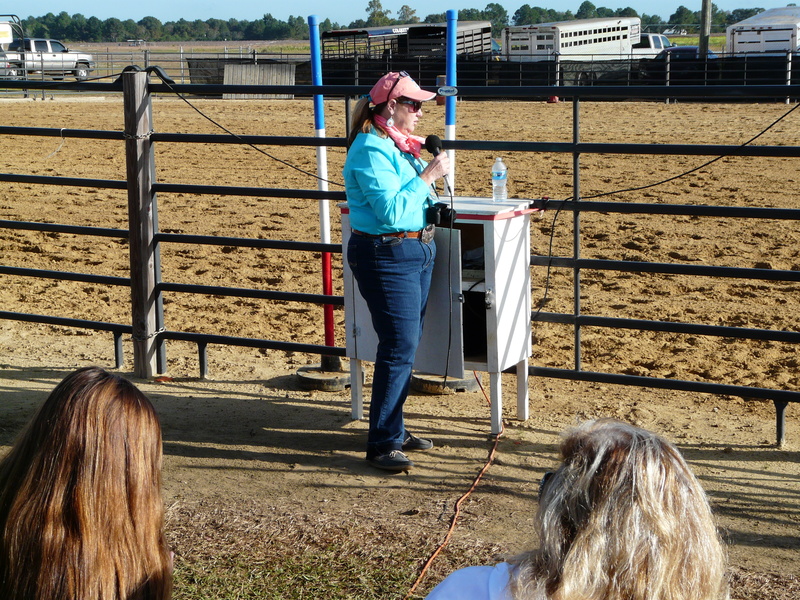 For more information, visit the Clemson Extension Livestock and Forages Team‘s Facebook page.